Many people think that long boarding is an activity which can be played only by boys. But now a day these habits are getting changed, girls are over ruling men in advance. Girls from every place are doing every stunt and perform many activities as boys do and they are much interested in riding long boards. There is more number of Longboard designs for female rider and in their mind. With each passing year, more and more women are getting attracted to this popular sport. No matter whatever you do either school or college, long boarding is the sport that can make your mindset steady and fits your body. There are some best girl’s long board which can make them more safe and fun. Krown Maple 9″ x 43″ Pintail Long board Skateboard is constructed by a Canadian Maple. The long board is featuring Bamboo / Maple Core Construction. This construction is one of the most popular for riders for their strength and rigidity, awesome looks & renewable resource. It is designed by a 9 inch x 43 inch Pintail Shape, with 6 inch silver trucks and a black 65mm 78a wheels and black Grip tape on the top of the board to their exotic Series. Atom Pintail Long board is a classic Pintail shaped board. These awesome pintail long board great for cruising. 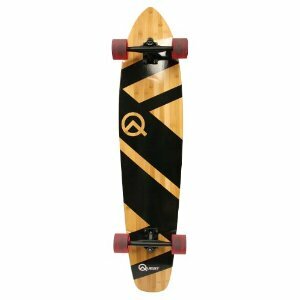 The features of Atom Pintail Long board is as 8.5 inches aluminum trucks; Abec 5 bearings; deck – maple laminate deck; urethane wheels; full coverage grip tape on the top of the board. This long board is unique in that the deck is lower at the center than where the trucks are mounted. This lowers your center of gravity giving you more stability at greater speeds making it great for speed-boarding. These boards are useful for the professional for gliding on the mountains, hills etc. Atom Drop-Through is constructed by a maple laminate deck; reverse King Pin (RKP) long board trucks with 245-millimeter axles which are to get you more down to with the Atom Drop through Longboard. Maximum stability makes this a great choice for down hilling. This long board includes a limited one-year manufacturer’s warranty against defects in materials and workmanship. It is easy to push takes wear and tear out of around-town commutes. Atom is a line of boards produced by MBS for sports and riders. Atom is a line of boards produced by MBS for sports and riders.